I have never been much of a singer, or any sort of musician. I think much to Susanna’s disappointment, but if you ever heard me sing you would understand my reluctance. So it is nice to see Will and Ben at least try music. Ben has been playing trumpet all year; Will sang in the 5th grade chorus and put on a concert tonight. 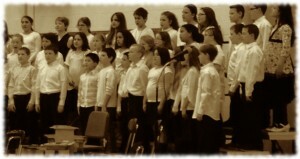 William singing in his 5th grade concert. One of the joys of parenting is the short notice events. I think the school is pretty good about sending notices home, but there is a disconnect between the school and the parents (of course life is much too exciting to pass on notes to parents). And I don’t make a huge effort to check updates on the school’s web page; but it is more fun to blame the kids than take responsibility for scheduling. Typically Will or Ben will let us know Wednesday or Thursday night about an event planned on Friday night that they want to attend; after we have spent the evenings earlier in the week making our weekend plans. This time we got a little more heads-up. But not really. Two weeks ago Will mentioned that he had a concert coming up, but no details. At least not until yesterday. The concert was nice. It was crowded – lots of family and not quite enough seats. The 5th grade class sang 4 songs at the start of the concert and were followed by the middle school chorus and then middle school band. Next year we will get there a little earlier to make sure we get good seats. And will make Ben wear a nice shirt. But that shouldn’t be a problem. I thought about recording the concert. But I figured it wasn’t worth the effort to make a poor quality iPhone video mostly of the back of the woman’s head sitting in front of me. Anyway, I really wanted to just sit and enjoy the music.